Prime Minister, Narendra Modi and the Prime Minister of Singapore, Lee Hsien Loong at a Business and Community event, at Marina Bay Sands Convention Centre, in Singapore on May 31, 2018.
fifteen, MOU between Himalaya Drug Company and PT Kalbe Farma – for setting up joint ventures. 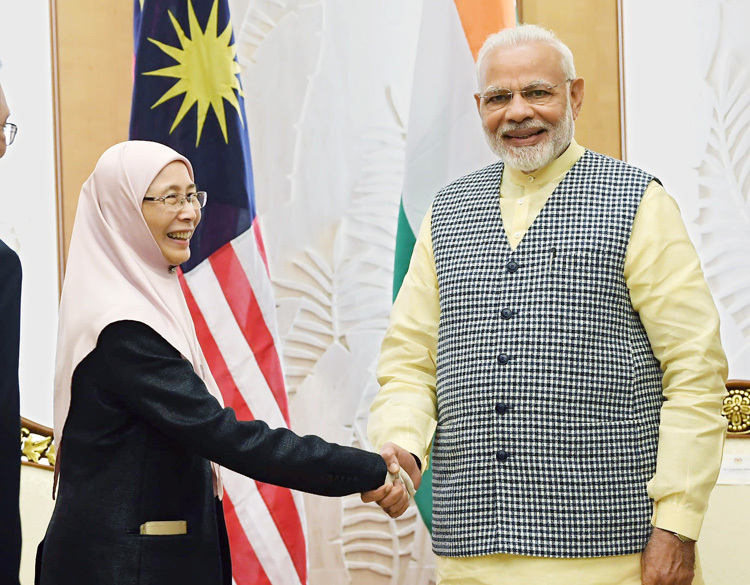 Prime Minister Narendra Modi meeting the Deputy Prime Minister of Malaysia, Dr. Wan Azizah Wan Ismail, in Kuala Lumpur, Malaysia on May 31, 2018. The delegation level talks also resulted in following announcements: Tata (India) and PT Pindad (Indonesia) to collaborate for supply of TATA trucks; CII (India) to open its first overseas office in Jakarta, and; Letter of Intent signed in April 2018 for twinning Bali and Uttarakhand as sister provinces. India and Indonesia have been strategic partners since 2005. Indonesia is India's largest trading partner in the ASEAN region. Bilateral trade of $13.43 billion in 2016-17 has now reached $18 billion. Indian companies have invested $15 billion in Indonesian economy. 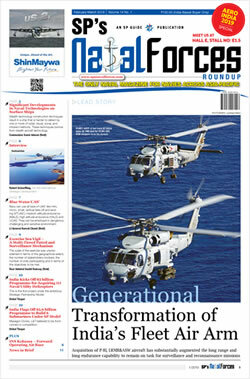 Strengthening maritime security cooperation is a focus area. Sabang port in Aceh province is closest to Nicobar Islands. Presently, Sabang is underdeveloped but strategically important deep water port close to Malacca Straits through which a major part of India's east bound trade passes. In a joint press conference after discussions, Modi said India's AEP and the vision of SAGAR (Security and Growth for all in the Region) matched Widodo's Maritime Fulcrum Vision. Modi also said both countries will double efforts to take bilateral trade to US$ 50 billion by 2025 from US$ 18 billion in 2017. 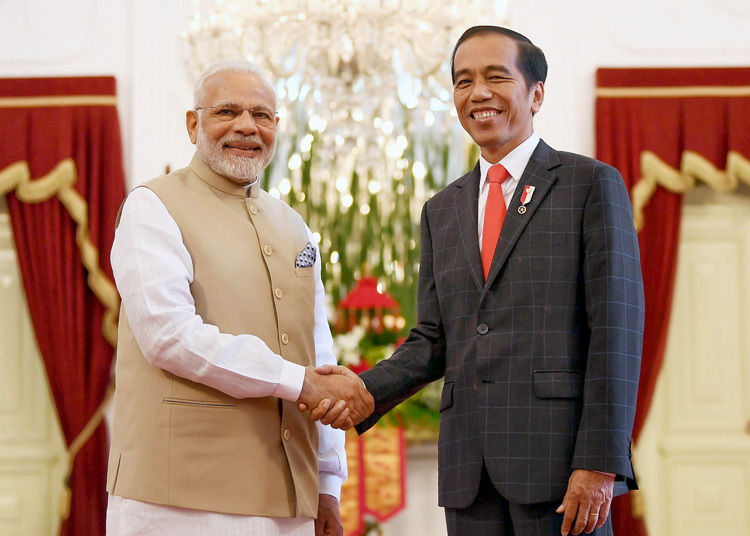 Widodo told media, "India is a strategic defence partner...and we will continue to advance our cooperation in developing infrastructure, including at Sabang Island and the Andaman Islands." Sabang Port, which is 40m deep, can be developed to accommodate both commercial vessels and submarines. Both leaders reiterated importance of achieving a peaceful and prosperous Indo-Pacific region where sovereignty, international law, freedom of navigation and overflight, sustainable development and an open and fair trade and investment system were respected. In an address to the Indian diaspora, Modi announced 30-day free visas for Indonesian citizens and invited Indians expatriates to visit India. After Indonesia, Modi visited Malaysia where he met the newly elected Malaysian Prime Minister Mahathir Mohammad, who at 92-years of age won a stunning victory. Modi was the first foreign head of state to congratulate Mahatir Mohammad in person. The two leaders held productive discussions on bolstering bilateral strategic ties. After Malaysia, Modi visited Singapore. 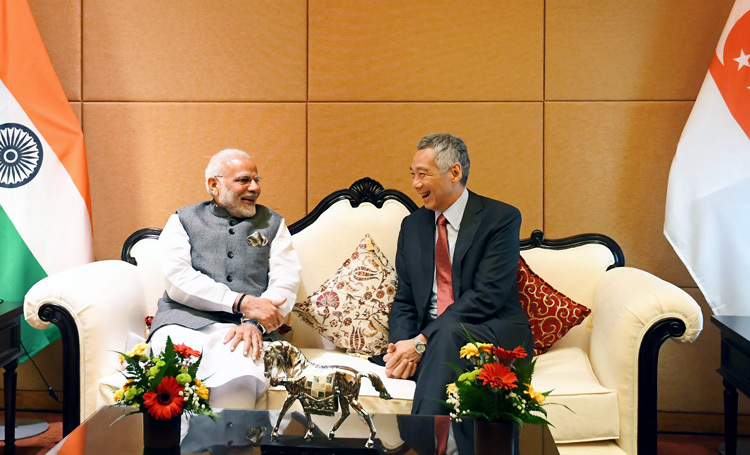 During his three-day visit to Singapore, Modi held wide-ranging talks with his Singaporean counterpart Prime Minister Lee Hsien Loong and delivered a keynote address at the Shangri-La Dialogue – Modi being the first Indian head of state to do so at this premier defence and strategic affairs summit. In his keynote address Modi said India's vision for the Indo-Pacific region is a free, open and inclusive region that embraces all in a common pursuit of progress and prosperity. His emphasis was: Singapore is the gateway for India to the ASEAN and east; with bilateral trade growing, India and China must work together; India stands for a free, open, inclusive Indo-Pacific region; globalisation key to development and is for open and stable international trade regime, and equal access as a right under international law to the use of common spaces on sea and in the air that would require freedom of navigation, unimpeded commerce and peaceful settlement of disputes in accordance with international law. Modi also called for an end to protectionism in this age of globalization, adding, "All of this is possible, if we do not return to the age of great power rivalries. I have said this before: Asia of rivalry will hold us all back. Asia of cooperation will shape this century." At a business event in Singapore, Modi launched three Indian mobile payment apps - RuPay, BHIM and State Bank of India. On the last day of his Singapore visit, Modi also met Jim Mattis, US Defence Secretary and discussed security related issues. 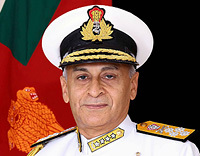 He also visited the Changi Naval Base and met officers and sailors of the Indian Navy and Royal Singapore Navy. All in all, PM Modi's visit was strategically important given the backdrop of China's militarization, claims and aggressive activities in the East and South China Seas. Indonesia too has dispute with China pertaining to fishing rights. In its pursuit to become a 'great power', China is incrementally continuing to apply its hard and soft power, resulting in the need for affected nations to forge together. Some scholars are of the view that Indian investments in Sabang will be countered by China fortifying its bases in India Ocean Region (IOR). This is naïve because China is already going ahead full steam in establishing naval bases in IOR under the euphuism of "strategic Support Bases". The nations of the world need to work together in ensuring freedom of navigation, global commons and unhindered trade. This is where importance of the successful visit by Prime Minister Narendra Modi to these three ASEAN nations lies.